A means to improve instruction and program design. Assessment is the ongoing process of gathering evidence of what each student actually knows, understands, and can do. Comprehensive assessment approaches include a combination of formal and informal assessments—formative, interim, and summative. An effective assessment system can be used to evaluate the extent to which students are learning and thriving based on state standards and local goals. Assessment results can be used to suggest which curriculum goals need to be addressed, how instructional strategies should be modified, and whether or not a particular form of instruction has been successful. Contains Margaret Heritage’s explanation about formative assessment and promotes formative assessment as “a powerful day-to-day tool” for teachers and students to improve the quality of teaching and learning. This article also explains how classroom climate and the role of the teacher and students all play a significant part in making formative assessment successful. Visit this California Department of Education (CDE) Web site to view the most current information about California statewide assessments. Find resources for the communication to stakeholders including communication toolkit and videos. Subscribe to the e-mail list to receive regular updates. Visit this portal for the information of CAASPP test administration, training materials, and access to the Test Operations Management System, Practice & Training Tests, Smarter Balanced Digital Library, and etc. Login credentials are required for the access to the test and Digital Library but not to the information and training materials. California K-12 educators may obtain their login credentials through their local education agency’s CAASPP coordinators. Understand what and how students are being tested with these and many other useful documents to guide curriculum implementing and instructional strategy planning in your schools and districts. Assessment blueprints in ELA/literacy (PDF) and mathematics (PDF) provides details in content and how content will be tested. Content Specifications in ELA/literacy (PDF) and mathematics (PDF) provides information how the Smarter Balanced assessments cover the range of knowledge and skills in the Common Core State Standards. This is the second in a series of three articles on interim assessment. This article emphasizes the importance of making sure the assessments used are comparable when comparing data horizontally (across classes, schools, or districts), vertically (comparing the school level to the district, state or federal averages), or longitudinally (looking at individual student growth or student cohort achievement over time). This is the third in a series of three articles on interim assessment. This article emphasizes the importance of a balanced approach to assessment, using formative and interim assessment to inform day-to-day practice and summative assessment to capture what has been learned at the end of the school year. Examples are given of multiple measures and of how administrators and teachers use data to inform their practice. Formative assessment tools and processes embedded in instruction provide teachers and pupils with timely feedback to guide shifts in instruction and learning. Effective assessment processes provide immediate, actionable data about classroom learning to help teachers adjust their teaching practices. Formative tools help teachers and students gauge learning, which can lead to more targeted student questions and learning activities. Teachers can use formative assessment tools to provide corrective feedback, modify their instruction, or identify areas where additional instruction and other supports are needed. Interim assessments are typically administered formally at a school- or district-wide level at regular intervals throughout the school year. They provide information for teachers that can be aggregated and reported at a broader level for the purposes of predicting students’ ability to succeed on a summative assessment, providing data on the impact of specific programs or instructional practices, or diagnosing gaps in a student’s learning. Summative assessments are conducted at the end of a specific timeframe, often at the end of a semester or school year. They are designed to evaluate students’ performance against a defined set of content standards and are often highly structured. A report from the National Research Council describes the importance of assessment as follows: “Educational assessment seeks to determine how well students are learning and is an integrated part of the quest for improved education. It provides feedback to students, educators, parents, policymakers, and the public about the effectiveness of educational services.” (1) Ultimately, assessments are important because they provide information that can be used to ensure that all students achieve at comparably high levels. Researchers Black and William found that using formative assessment in the classroom improves student learning, with the most notable gains among low-performing students. (2) The results show that formative assessment helps to narrow achievement gaps and raise overall performance. This is consistent with a number of other studies that point to student gains supported by formative assessments. By focusing on the relationships among the learning model for a given content area (Cognition), assessment methods based on that learning model (Observation), and inferences, educators can make instructional decisions based on the observations made about what students truly know and can do (Interpretation). 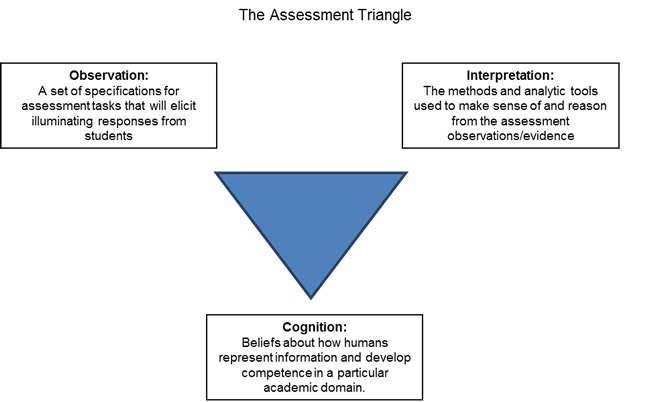 (2) The assessment triangle above serves as the foundation for the work of the Smarter Balanced Assessment Consortium (Smarter Balanced), tasked with developing an assessment system and tools based on the new Common Core State Standards (CCSS) for English language arts (ELA)/literacy and mathematics. Smarter Balanced is committed to ensuring that all students, regardless of subgroup status, have the opportunity to learn and demonstrate their knowledge of CCSS content. The consortium is currently developing a balanced set of measures and tools—formative, interim, and summative—that are designed to yield student data to inform instruction, interventions, and professional development and to accurately measure each student’s progress. Conform to rigorous industry standards for test development. Incorporate multiple methods for measuring student achievement. Use resources efficiently and effectively. Provide for inclusion of all students. Provide readily available and understandable information on the assessment system for parents, teachers, schools, and the public. Use assessments for multiple purposes.